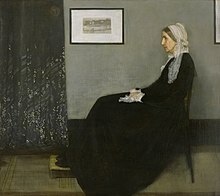 Péintéir agus eitseálaí Meiriceánach ab ea James Abbott McNeill Whistler (10 Iúil 1834 – 17 Iúil 1903). Rugadh i Lowell, Massachusetts, é ach chaith sé an chuid ba mhó dá shaol mar dhuine fásta i Sasana. Ní raibh áit ina chuid saothar ealaíne don mhaoithneachas ná le tagairtí mórálta. Chleacht sé "ealaín ar son ealaíne", agus b'fhearr leis stíl dhíreach neamhornáideach. Tá sé sin le feiceáil ina shíniú, a bhí stílithe i bhfoirm fhéileacáin a raibh ga righin fada air in áit an eireabaill. Tá clú ar mhórshaothar leis, Arrangement in Gray and Black no. 1 (1871) nó, mar is fearr aithne air, Máthair Whistler. D'éag sé i Londain Shasana agus é 69 bliana d'aois. 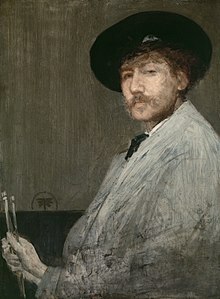 Rugadh James Whistler i Lowell, Massachusetts, agus tógadh é i Lowell, Stonington, Connecticut, Springfeld, Massachusetts, agus ansin Cathair Pheadair, sa Rúis. Innealtóir iarnróid ab ea a athair. Fostaíodh an t-athair ar feadh tamaill chun iarnród a thógáil sa Rúis. Blianta ina dhiaidh sin, agus James fásta, thug sé an leabhar gurb i gCathair Pheadair a saolaíodh é. Dúirt sé go raibh cead aige áit a bhreithe a roghnú agus nárbh é Lowell a rogha. D'fhreastail sé ar Acadamh Míleata na Stát Aontaithe ag West Point, Nua-Eabhrac. Tugadh an leathanach seo cothrom le dáta an 29 Lúnasa 2015 ag 18:43.